You will love the authentic industrial look of the Vintage Swivel Stool Light Wood. 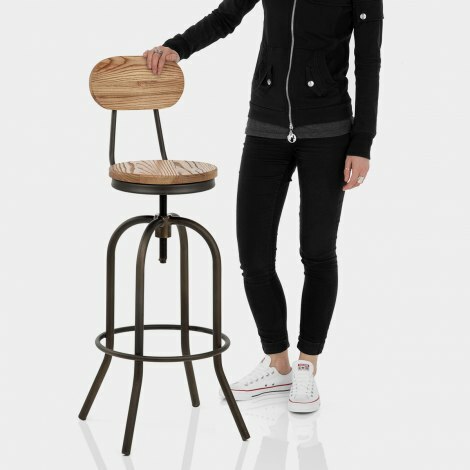 With a factory-style look inspired by classic drafting stools, it is the perfect statement piece for modern spaces and will work in harmony in a rustic environment. Crafted from solid light wood, its supportive backrest is elevated by two metal uprights, with a matching wooden seat. Designed for your convenience, an incorporated screw-thread allows for easy height adjustment. Finally, for a true vintage touch, the four-legged frame has a dark antiqued finish, complete with a stylish circular footrest and handy protective floor plugs. "Beautiful stylish stool at an excellent price "
Great customer service. Next day delivery. Delighted with stools, very easy to assemble. These are great stools perfect for my kitchen. They are easy to assemble. I like that the height can easily be adjusted. I am very happy with them. This is the 3rd Vintage stool we ordered from Atlantic Shopping. It arrived very promptly and it is just as good as the other 2. Many thanks. Fantastic stool. Looks great in our Kitchen. Easy to assemble. Excellent value for money. A stool of beauty. The product is well made and is as good as it looks.